I am just curious. For those that do not know I now live on the border of Illinois and Indiana. It has been interesting talking to officials across the two states how they do things. I guess I have two questions. How do you get your playoff assignments? And what is the format of playoffs? For example, in Illinois, we have 4 levels of playoffs in each class. Officials are assigned up the latter. You do not work the next level without being assigned/worked the previous level. So a State Final official for that year works a Regional (Championship), Sectional (Semifinal Championship), Super-Sectional and State Finals (Work two games, Semifinal and/or Championship/3rd Place game). It must be noted that when you work a State Finals, you are considered a State Final official when you work the two games, regardless if you work the actual title game. We also have 4 classes. The Girls and Boys stagger their playoff starts. Each does a regional week at a different time. So to make it clearer, next Monday is the start of Regionals for 3A/4A Boys and this weekend is the State Finals for 1A/2A Girls. I probably gave a lot of information, but I would like to know what your state does and how you are assigned? As much detail as possible too would be nice. Finally, the Girls Administrator for the IHSA assigns every official in every game as does the Boys Administrator. No associations have anything to do with assignments. 1A and 2A have districts and then regional tournaments with an eventual final 8 team state championship bracket. 4A and 5A go straight to a 48 team seeded bracket. The top 16 seeds all get a first round bye. Boys and girls operate in the same way. Assigning: This is my best understanding but I can not confirm 100% accuracy. About 2 weeks before the end of the season we have a voting system. All coaches, officials, ADs, and assignors get to vote for up to 20 referees. The results of the voting are never made public but there is supposedly count number thresholds in order to work certain levels, great 8/final 4/state championship etc. There is a committee of ~5 individuals that make the ultimate recommendations to the state board of who should work what games each round. The ultimate decision is up to the state association but they have tasked this committee with making recommendations. District tournaments are assigned by the assignors for their respective leagues. All of our assignors, and there are a plethora of them, assign both boys and girls for their respective leagues so there is no dichotomy there. Outside of or after districts the playoff decisions are made by the committee recommendations. Random notes. You must qualify for playoffs by completing a mechanics and video test, attending monthly meetings, and be in good standing with the association. Officiate at least 12 varsity contests and 2 sub varsity contests throughout the season. Officiate 6 girls games, or 20% of your total schedule. You are supposed to be available for the duration of the playoffs or not apply to work. If you work the state tournament 5 years in a row you must take a year off. All that I can think of right now but it seems like the process is always getting little tweaks year to year. 1) Sectional, There are numerous geographic sections throughout the state and each holds a tournament. Officials assigned by a coordinator appointed by the commish. 2) State , North vs South ,state divided whereby the winners of each class would face off for the state championship. State Coordinator and their Committee make officials assignment. Coordinator appointed by CIF. Last edited by The_Rookie; Fri Feb 23, 2018 at 03:28pm. Florida has 9 classifications, 1A thru 9A, primarily based on school population. 1A is smallest, and 9A is largest. 1A thru 4A have 8 districts. 5A thru 9A have 16 districts. The top two teams from the season ending district tournaments advance to Regional. District winners host the first round vs. the runner up of the other district. Districts 1v2, 3v4, 5v6, 7v8, etc... It's possible that district opponents meet in the second round of their classification's tournament. Genders are staggered. Girls begin one week earlier than boys. Last night was the first round of Regional play for boys, while the girls are playing Regional Finals tonight. Officials work in local associations. Local associations submit a list of ranked playoff crews. My association is small, so we submit 7-8 playoff crews, while the association to our south submits 14+. FHSAA assigns games to associations. Sometimes FHSAA makes the specific crew assignment, and sometimes the association decides which crew goes to which game. Associations may not work a game for a school with which they are contracted to work the regular season, though sometimes FHSAA will allow a local association work a game between two local teams. Crews may not see the same team twice during the playoffs. Evaluators observe games to assist FHSAA with crew assignments as the playoffs progress. Being on the #1 crew of your local association gives the best change to advance through Region and State, but it doesn't always guarantee games. I have worked a State Final on the #3 crew and #1 crew, while I've seen a #1 crew go no further than the first round. On a somewhat related sad note, Stoneman Douglas girls basketball decided to forfeit their Regional game after the horrific shooting at their school that left one of their players fighting for her life. Section playoffs is the first step. Teams qualify based upon regular season league play and some sections also use the maxpreps rankings for at-large qualifiers. Each Section does this stage a little differently. For example, some Sections have an Open division while others just stick with D1, D2, D3, etc. Each Section gets to send a certain number of teams on to Regionals. This is based upon how many schools are in the Section. Following Sections, teams qualify for either NorCal or SoCal Regionals. At this stage the CIF central office takes over the tournament. It seeds the teams and makes the brackets. The winners of these brackets face each other in the State Finals, so each championship game is North v South. There are different levels for the schools to compete in: Open, D1, D2, D3, D4, D5, & D6. D6 may just end with the Regional Final and not have a State Final. Officials: At the Sectional level the officials are handled by each Section. They are free to do this however they wish. Brackets can range from 32 teams, 16 teams, to only 8 or somewhere in between. I don't think that there are brackets bigger than 32 anymore, but the Southern Section used to have a couple of 48 team brackets a few years ago. Most Sections have the local area assignors cover the home games played in their territory during the early rounds. Once the teams reach the semifinals or Sectional Finals, the folks in the Section office put crews on the games who may involve officials from different local associations within the Section. For example, if a section has two associations during the season which break the territory up into North and South, those groups will cover the early games with their guys, but then could find themselves working on a crew with officials from the other group for the last round or two. NorCals/SoCals: The local officials associations nominate a certain number of officials to the CIF office. The office then takes these officials and makes crews out of them from each Section. Most of the time these crews work Regional contests with teams from other sections, however once in a while a crew will see a team from their home section. The officials are told prior to the start of regionals how many early round contests they are pre-selected to work--1, 2, or 3. The CIF office staff makes this choice. The officials are then awarded Regional Finals based upon what the CIF staff observes. The State Championship crews are selected from the Regional Final crews. Last edited by Nevadaref; Fri Feb 23, 2018 at 08:23pm. A relatively small population state, so the setup is fairly simple. Teams are classified 4A, 3A, 2A, and 1A, with 4A being the largest. Regional tournaments are the first stage. There are 3 Regions for the 4A and 2 for all other levels. There are two 4A Regions in the South (Vegas) and one in the North, while all other levels have one Northern Region and one Southern. The Regional tournaments are only 8 teams and only 6 in a couple of cases at the smaller school levels. Officials: There are four associations in the State. North, South, Central (very small), and East. Each of these associations has a Commissioner appointed by the State Office. The Commissioner handles the assignments, with some advice from the Executive Board of the local association, for the Regional stage. Each association and commissioner handles all of the games played within their regular season territory. The State tournament consists of a final four teams for each of the four levels. Therefore, there are only State semi-final contests and State Finals. For 1A, 2A, and 3A levels the winner and runner-up in the Regionals qualify for State. For 4A, the winner of each of the three Regions qualifies and one of the runners-up will get the 4th spot. In even years, the 4th spot goes to the Northern Region runner-up because the event is held in Reno. In odd years, the tourney is in Vegas and the two runners-up from those 4A regions play a game to determine the 4th qualifier for State. To receive a medal the official must actually work a State Final, not a semi. The State office creates a matrix which divides the officiating slots for the games among the four associations. Each commissioner then gets to fill those designated slots with officials from his area. The State tourney rotates between being held in Reno and Las Vegas each year. It has never been held anywhere else. All crews for the State games comprise of mixed crews with officials from the different associations. Usually the East and Central officials don't receive spots on 4A games. State tournament games are solely based on coaches votes. The more votes an official gets, the further that official goes into the tournament. Connecticut has been doing it this way for tournament games for at least forty years, and believe it, or not, coaches usually do a pretty good job of selecting the best officials. Every year I look at the tournament list of the thirty-plus officials selected from my local board for the state tournament and only have to scratch my head for one, or two, of the selected officials, and they're usually gone by the end of the first round. Officials must have worked at least eight varsity games to be eligible for state tournament games. The number of officials selected from each local board is based on how many high schools that local board services. The more schools serviced by a local board, the more officials from that board get selected to work the tournament. All state tournament games up to (but not including) the quarterfinals are two person games, quarterfinals and up are all three person games. Two person, or three person (for later rounds), crews always have officials from the same local board, one never works with strangers. Which local group officials work each individual game? Let's say we have five local boards in the state, A,B,C,D, and E.
Let's say we're local officials group A. We can work games that involve two teams from the local group A geographic region (for example A versus A). We can also work games that involve teams from local group geographic regions B, C, D, and E, (for example C versus D) as long as a local group geographic region A school isn't in the game. We can't work any games that involve an A region team against any other region team (for example A versus D). No "home jobs" in the state tournament. The coaches run the show and that's they way they want it. Schools that win at least 40% of their games (usually eight wins) (with a few exceptions) make the state tournament. Most tournament classes are based on school population. One exception is an "open" division, mainly for schools that can take students from outside a specific geographic area; Catholic schools, magnet schools, charter schools, and state technical schools, especially these types of schools that have been very successful in the state tournament in past years due to their broad reach to recruit students (I said recruit "students", I didn't say recruit "athletes", wink, wink, nod, nod). The state high school interscholastic sports governing body has one assigner who assigns both boys, and girls, games. Local assigners have nothing to do with state tournament assignments. All state finals, all divisions, for both genders, are played on a weekend in late March at the Mohegan Sun Casino's arena, home of the WNBA Mohegan Sun. Some have a problem with it's non-central location (it's in the far southeast corner of the state). Some have a problem with students having to pass by the gaming area (under twenty-one are not actually allowed in the gaming area) to get to the arena. The students will actually see adults gambling, smoking, and drinking alcohol, thus contributing to juvenile delinquency. Some have a problem with some of the games being played Sunday (Mohegan Sun Casino tried a Friday/Saturday format for a few years but it interfered with many of its Friday night entertainment activities, so they switched to a Saturday/Sunday format). Connecticut high school sports are seldom played on Sundays, being the Lord's Day, a day of rest, and all (like it was the eighteenth century). Here's a new, interesting twist for my local board this year. Previous to this year, officials from my local board, if selected by the coaches, could work both boys, and girls, state tournament games. For several years, other local boards in Connecticut made their officials chose to work either boys tournament games, or girls tournament games, but not both. My local board was an outlier. My local board made a change this year, following the policy of all the other local boards in the state, now, if selected to work both, our local board officials must chose to work either boys tournament games, or girls tournament games, but not both. The reason stated was to open up state tournament assignments to as many of our local board officials as possible. Needless to say, the dozen, or so, guys that worked both boys, and girls, state tournament games in the past were quite upset. They believed that if they were selected by both boys, and girls, coaches to work the tournament, they should get tournament assignments for both boys, and girls games. Our meetings, were to say the least, very interesting this past year. Last edited by BillyMac; Sat Feb 24, 2018 at 06:44am. Patron Saint Of Basketball ??? Rather than using size of schools, they use a Byzantine formula based on the performance of the basketball team over the past two years ... My understanding is this was put in, along with the open division, as a reaction to transfers and schools recruiting, which made size less relevant than it once was. Similar guidelines here in Connecticut, for similar reasons. They try to tweak the guidelines every year, but the schools that "recruit" often win a lot of state championships, especially Catholic schools. Last edited by BillyMac; Sat Feb 24, 2018 at 04:06pm. Missouri has five classes in basketball. Class 5 is the biggest and Class 1 the smallest. Each class is split into 16 districts, and the postseason starts with the district tournaments. Everyone qualifies for them. They are 5-8 teams depending on the class. Bigger classes sometimes only have 5-6 teams while smaller classes usually have 6-8. All of the district tournament managers for each area of the state have an officials draft to select officials for their tournaments. Starting with district tournaments, every postseason game is 3-person. The 16 district winners in each class play in the sectional round. The quarterfinal round of 8 is next. These are assigned by the state office using recommendations from assigners/observers around the state. These are all neutral site games at bigger high schools or colleges. The final four is also assigned by the state with recommendations from observers as well. It has been played in Columbia for a long time but is moving to Springfield for the next five years I believe starting this year. A wrinkle this year is that they are assigning final four officials but they will only work semifinal and state final games. They are bringing in another group of officials to work the third place games in each class. In the past this was not the case. The officials who worked the semis worked the third place games too. Who Would Have Thunk It ??? ... the schools that "recruit" often win a lot of state championships, especially Catholic schools. 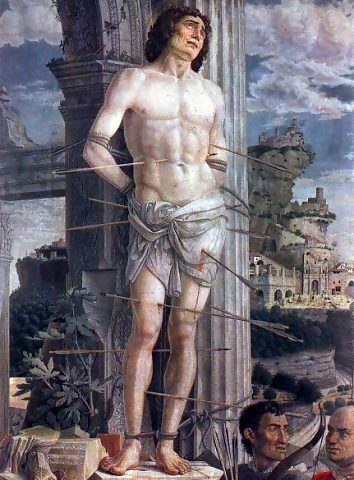 There actually is a Patron Saint Of Basketball (Athletes), Saint Sebastian. Who would have thunk it? Those arrows don't appear to be legal equipment, no matter what color. Last edited by BillyMac; Sun Feb 25, 2018 at 02:38pm. Then there is Georgia, who starts one part of the bracket all over again mid-playoffs. The Georgia High School Association confirmed Monday that the Tucker High School girls basketball team will have to withdraw from the rest of the state basketball tournament. As a result of Tucker's dismissal, there will be significant changes to the Class AAAAAA girls bracket. The Tucker game against Harrison High School, scheduled for Tuesday, Feb. 27, is canceled. Grovetown High School, which lost to Tucker in the first round, will get the chance to play at Bradwell Institute, who was defeated by Tucker in the second round. That game will be held Wednesday, Feb. 28. The winner of the Grovetown vs. Bradwell game will play against Harrison Thursday, March 1 in a quarterfinal round game. The winner will advance to the semifinals, which will be played as scheduled at West Georgia College on March 3. Times for the rescheduled games will be made by the opposing schools. The schools....1A to 6A. Boys and Girls have the same tourney formats. Each classification decides its own playoff format. It ranges from 16 teams to 40 teams 2-4 taken from each league, determined by the whatever method each league chooses. It could be regular season conference standings. It could be a conference tourney. Some levels have some at large bids added to the mix. The biggest class takes 24 from the leagues plus 16 at-large bids. Seeding is largely based on a power ranking but they'll shift teams around to not have first round match-ups from the same league. Play-In & Play-offs: Games are played at the higher seed's location up through the round of 16. Officials Selection: Officials from the association working the home team's games (with a couple of exceptions) typically cover the games up through the round of 16. State Tournament: Once it is down to 8 teams, the games are held at predetermined sites, one for each of the 6 levels scattered around the state. Both boys and girls are held at the same site for a given classification. Officials Selection: Each association around the state is allocated a number of spots at each classification proportional to number of schools serviced in that classification. How each association chooses their officials is up to each association. Some have votes, some have the assignor designate, etc. Portland uses a vote by the coaches and officials. Currently, 1A-3A are covered by 2-person crews (moving to 3 next year). 12 Officials (total) are selected to cover those games. They 4A-6A tourneys are 3-person crews (started last year). 18 officials (total) are selected to cover those games. 90 officials total across all classes. Those officials work all of the quarters, semis, and championships at the respective classifications. While they are not necessarily all announced at first, the crews are preassigned the games for the quarters and semis (and consolation bracket games) for both the boys and girls. While it isn't absolutely true, almost everyone will work at least one girls game and one boys game. Almost everyone will work a game in each of the time blocks (morning, evening, night), meaning everyone will get at least a quarter final or semi-final of some type. Two observers are present watching all of those games. Based on their observations, they select the officials' placements for the final day (Championships, 3rd place game, and a 4th place game, boys and girls). Obviously, a few of the officials are very happy on the last day....those that get Championships assignments. A few are disappointed. It is not unlike the teams...only a few can get the big finals. Last edited by Camron Rust; Tue Feb 27, 2018 at 03:46am. In Massachusetts, there are four divisions (I thru IV), boys and girls. Teams must finish at least .500, or at least second in their league, to qualify for the state tournament. The state is divided into four sections (North, South, Central, West). Each sectional plays to a champion, creating the four state semifinalists (exactly like the NCAA/Final Four model). Each section has its own postseason assignor, who bases his roster strictly on the recommendations of the regular-season assignors, who must submit a list of names for the boys side and the girls side. Most lists have the same names on both, with a few exceptions. Coaches’ input was eliminated as a criterion by the MIAA a few years ago, so unlike certain states, coaches have no impact on officials’ postseason prospects. If teams from the same “area” square off, all three officials will be from that area. If the teams are from different areas, there will be one official from each of the three areas, the third acting as the “neutral” official. In these matchups, the neutral official is always the R, the official from the home area the U2, the official from the visiting area the U1. So, in our section at least, the more teams from your area that advance, the more opportunity for officials from your area to advance. There is also the general guideline that you are not to work a team more than once in the postseason. Once things reach the state-semifinal stage, North plays South, Central plays West. So let’s use Central-West as an example. There will be 8 semifinals (four divisions, boys/girls), so 24 officials. Twelve will be from Central, 12 from West, each game using split crews in a 2/1 ratio. I’m not sure how it’s determined which games get two Central officials and which two West. The assignors for the four sections retain their duties for the state rounds, assigning all officials needed from their section. Alternates are also assigned for the state semis and finals, almost always from the area where the game is played, since nobody wants to travel too far to be the A. For the state finals, the MIAA suddenly wants all-neutral crews. So the eight games are divvied up among the four sections, each assignor getting two to assign. Because of the desire for all-neutral crews, once again, the matchups determine the makeup. Therefore, if a North team is playing a West team in a particular state final, the crew will have to be from either Central or South, and so on. So at this stage, teams from “your” section advancing can be a bad thing. For example, if a team from your section makes the boys Division I state final, you are eliminated from having the chance to ref the boys Division I state final. But we’re talking state finals here, and only six officials from your section are going at all, so beggars can’t be choosers. Again, I can only speak to how our sectional assignor handles things, but if you work a sectional final, you will not work a state semifinal. And if you work a state semifinal, you will not work a state final. And you will not work state finals in consecutive years. This is all done to promote opportunity and creates at least the possibility of new faces being rewarded each season. But I know some of the other sectional assignors don’t subscribe to that philosophy, as one individual from another section has worked at least three consecutive state finals, while another from another section just went back-to-back. Sending the same people year after year seems crazy to me when there are literally thousands of high school basketball officials in the state. Officials in our section feel fortunate our postseason assignor has created all of those guiding principles to mix it up and give more people a shot once things reach the state level. I would have to imagine there is a sense of frustration and hopelessness among members of the sections where the same names get state finals year after year. It’s far from a perfect system, but at least in my neck of the woods, it’s a seemingly fair and open process, once you get beyond (and get over, for many people) the lists submitted by the regular-season assignors.